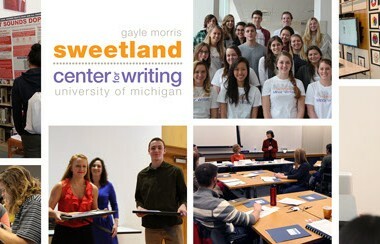 Hosted by the Sweetland Center for Writing, the Digital Rhetoric Collaborative is an online, community webspace by and for scholars and teachers working in computers and writing and digital rhetoric, and a born digital book series with the U-M Press. This fall, we announce two exciting initiatives. Sweetland is pleased to announce its first cohort of Digital Rhetoric Collaborative (DRC) Graduate Fellows! The program aims to recognize graduate students currently working in digital rhetoric who want practical experience in online publishing and website development. Fellows are selected on a yearly basis by the editors and board of the DRC, and receive an annual stipend of $500 as well as recognition on the DRC website. Our fellows were chosen from a talented pool of applicants and impressed our Board with their depth of experience and wide variety of skills and interests. We look forward to an exciting and productive year with them. Welcome! Becca Tarsa is a Ph.D. student at UW-Madison; her interests include digital writing and rhetorics, first-year writing, visual rhetoric and multimodal composition. Lately, Becca has been spending her time interviewing students at UW and Madison College about their online reading and writing, with the goal of learning more about their perceptions of and motivations for that activity. In addition to teaching and this research for her dissertation, she’s also been researching the role of narrative writing in video games by playing a lot of Mass Effect. Laura Gonzales is a doctoral student in Rhetoric & Writing and a University Distinguished Fellow at Michigan State University. Her research interests include intersections of cultural and digital rhetorics, as well as composition theory and second language writing. She has developed and taught courses in writing and rhetoric and is interested in the ways digital tools and spaces are used by multilingual writers. Lindsey Harding is a Ph.D. student at The University of Georgia. She graduated from Sewanee University’s School of Letters in May 2011 with an M.F.A. in creative writing and earned her B.A. from Columbia University in 2004. After teaching First-Year Composition for two years at UGA, she is now the teaching assistant for the Writing Intensive Program. Her research and writing interests include digital rhetoric, computers and composition, digital humanities tool design and development, and media-saturated fiction. 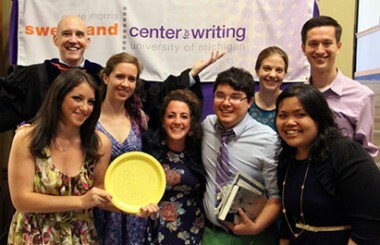 Liz Homan is a doctoral candidate in the Joint Program in English and Education at The University of Michigan. Her research focuses on secondary teachers’ uses of digital technologies; specifically, her dissertation work examines how teachers’ social networks shape their uses of web technologies in the English classroom. Her other interests include running, cooking, and hanging out with her rambunctious dog, Gertrude. Brenta Blevins is a Ph.D. student specializing in rhetoric and composition at The University of North Carolina at Greensboro. She has previously served as Assistant Director of the UNCG Digital ACT Studio and worked in the software development industry. Her research interests include digital pedagogy, wikis as genre and learning tool, digital literacy, and digital literacy learning centers.